In the past few years, night photography has become my passion. There are a couple of reasons for this. I have been shooting landscapes for many years, and guess I just needed something new in my photography-life to get me more inspired. I have always been fascinated with the night sky, but then I learned that the camera can actually see more than the human eye can of what's in the night sky. This super-human ability sold me on the thought of staying up late at night, sometimes on very cold nights, to take pictures. This eTip is all about what I've learned over the past few years and what some of my experiences have been. 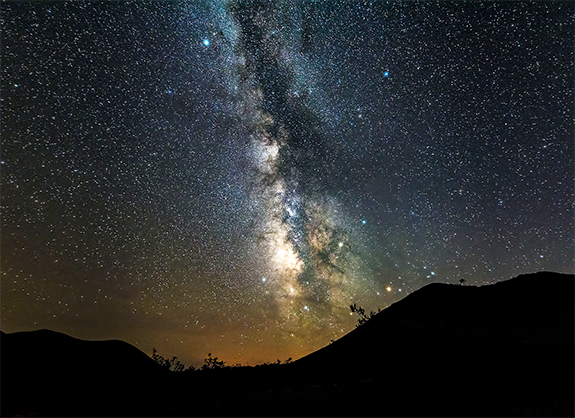 It also concentrates on shooting the night sky, where stars show up as sharp points of light. This includes the milky way. OK, the camera doesn't really have a super-power. Or does it? The extra-sensory ability that the camera has comes from the ability to take long exposures – where the shutter remains open for relatively long periods of time. 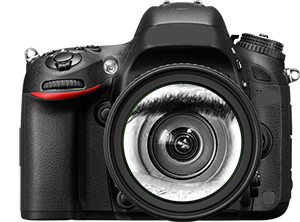 Modern digital cameras have a lens that focuses whatever light it gathers onto a light-sensitive sensor. The sensor captures light for the duration that the shutter remains open. Our eyes work in a very different way. Our eyes have an iris, similar to the aperture in a camera lens, that allows a varying amount of light to enter our eyes. Our eyes can also adjust to changing light, kind of the way ISO speeds work in a digital camera. It's the shutter speed of a camera that is really different, compared to our eyes, however. A camera's shutter can stay open for as long as we want it to, thus, we can capture MORE-light than our eyes can see. I'm no expert in how eyes work, but, my simple explanation would be that our eyes see things in multiple points-in-time – as if our brain had a shutter, and it was open for consecutive periods of 1/30 of a second - like a movie. When we open a camera's shutter for 30 full seconds, we're allowing much more-light to reach the sensor than could ever reach our eyes. In addition, as we increase the sensor's ISO speed, we're making our camera's sensor more sensitive to light than our eyes are. These reasons are why the camera can capture so much more information than our eyes could ever see! So, our camera has a kind of super-power. This extra light-gathering power will allow your camera to see MANY more stars than your eyes can, plus, you'll even capture satellites and other moving objects in space that your eyes could never see. I've learned that shooting at night is very easy, if you know what to do and you plan properly. The first few times, my results weren't very good because of poor planning. So, with a little research, I realized that shooting at night requires some simple preparation. Shooting at night assumes you know how to set your camera settings, as night photography requires you to shoot in "manual" exposure mode. The auto exposure system of your camera sees virtually no light at night, so, it can't get the exposure right - thus, you have to shoot in manual exposure mode, where you set the aperture, shutter and ISO speed. Auto focus also doesn't work in very low light, so you also have to use manual focus. I learned that you just cannot go out on any night you feel like it, to get good night pictures. You have to plan using software, so there will be something interesting to shoot. Most of this software is free and readily available on the Internet (see below). Once you know where and when to shoot, and you know how to set your camera, there's one last variable that we have no control over: the weather. But, even on nights where there are a few clouds, you can still get good night shots. I also learned, that you can easily underestimate how cold it can be on a cold, windy winter night! The last thing I learned is how gratifying night photography can be. 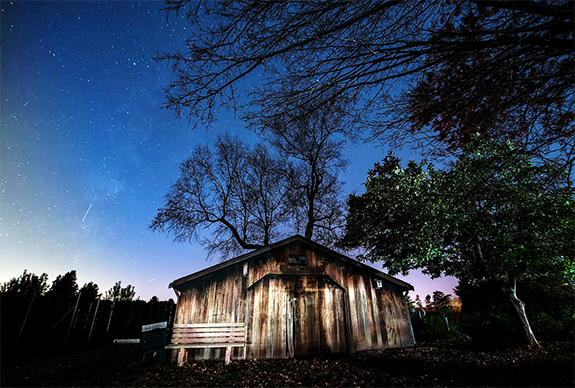 I've shot the night sky locally, around my house in West Hartford, CT. This is a relatively urban area with a lot of light pollution. I've found that even in a light-polluted area, it's still possible to get good night sky shots. You may not be able to get a good shot of the milky way, but night-sky photography is alive and well in urban areas! I've also traveled to some very dark places, where the main goal was to photograph the night sky. 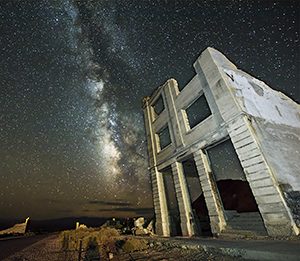 I went to Beatty, NV – a really dark place - to photograph the milky way. 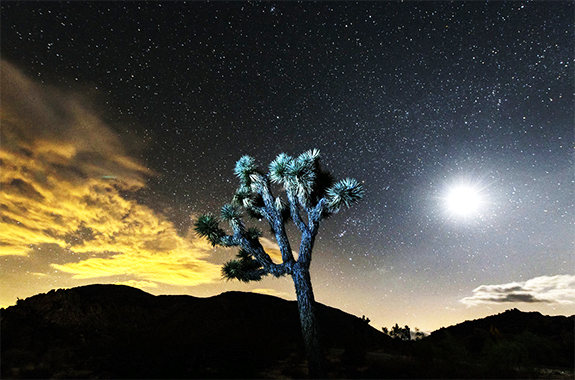 I've been to Joshua Tree NP, in southern California – one of my favorite places in the US for photography (landscape, night, macro, etc. ), and I've been to Tucson, AZ. 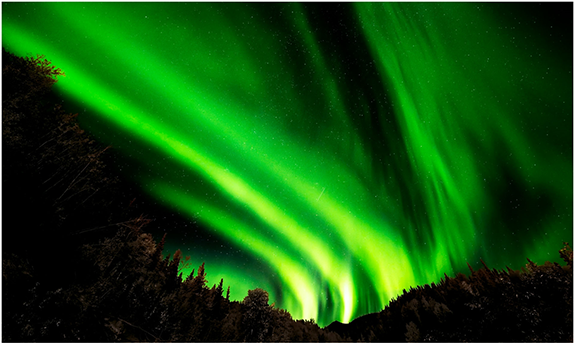 Recently, I was in Alaska, and spent a few days in Fairbanks, AK to photograph the aurora. This shot was taken at a local park near my house. barely see the milky way (just to the left of the trees). 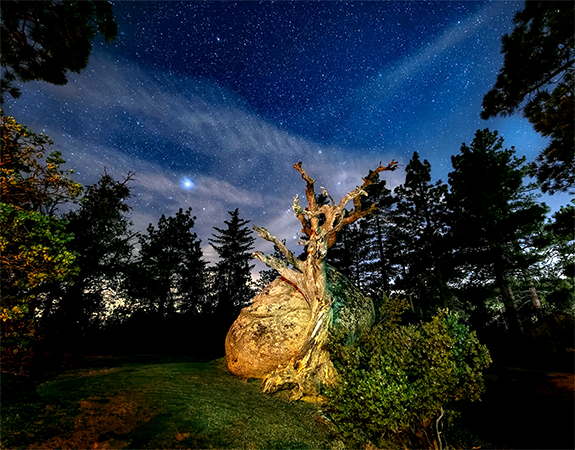 the rock and tree during the exposure. The moon can ruin (or make) any night shot. For the milky way and/or stars, I make sure that the moon is either "new" or just a crescent. I preferably like to shoot before the moon has risen, though. I generally consult the Photographer's Ephemeris to determine when the moon will rise and set, and make sure I'm out before it rises. Being a bit on the lazy side, I've never shot past 11pm. It doesn't really get dark until about 2-hours after sunset, so I will wait until at least then. If I'm shooting the milky way, the only time the "core" (the brightest part) can be seen, is in the summer - preferably late summer. During December thru February, the core isn't visible at all. 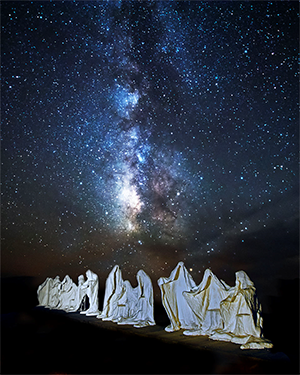 You'll need to consult either Stellarium or PhotoPills to determine what time (and what direction) the core will be visible, but the best images will be when the milky way core is above the horizon. I like to shoot the night sky with some-kind of foreground object, usually a building of some kind. Without a foreground object, even the milky way can be a little un-inspiring. I usually use an LED flashlight (filtered with a warming filter) to light-paint the foreground object. Usually, this just means shining the flashlight on the foreground object during the exposure. Light painting is easy and fun to do, and can make a huge difference in night photography. LED flashlights can be very "blue", however, so I put a small warming gel filter in front of the flashlight to warm the light. and need a bit of warming. All of these things are required, but most cameras, even most point-and-shoot cameras, can do these things. The last item (a dark place) may be the hardest to find. Most urban areas have a lot of light pollution, making it difficult to photograph the night sky. Use "Dark Site Finder" (https://darksitefinder.com/map/) to find dark places to shoot from. But, as I indicated above, you can almost always find someplace locally, even in an urban area, to get decent night shots. The Photographer's Ephemeris (TPE) (https://www.photoephemeris.com/) is a great place to start. It's free and, in its own words: "TPE helps you plan outdoor photography in natural light. See how the light will fall on the land, day or night, for any location on earth." TPE is great for planning sunrise/set and moon shots. Stellarium (https://stellarium.org/) is also free, and is great for planning shots of the stars and/or milky way. Use Dark Site Finder (https://darksitefinder.com/map/) to find dark places to shoot from. California/Nevada border in early September. Learn how to put your camera in manual exposure and manual focus modes. For focus, you'll want to focus on infinity. This can be difficult when it gets dark, so you'll want to do this before it gets dark. If not, you can try to use autofocus to focus on a distant light (street light, moon, etc.) and then reset your camera to manual focus – it MUST be in manual focus before you shoot. Set the focal length if using a zoom lens to its widest setting (lowest number, e.g., 14mm, 24mm, etc.). If using a DSLR, use a lens with a very wide focal length - 14mm-24mm on a full-frame sensor (or 9mm-16mm on a crop-sensor). The wider the better! In manual exposure mode, set your aperture to its widest (lowest number, e.g., f2.8, f4, etc.). So, if using a 24mm lens, your shutter speed would be 20 seconds (500 / 24). If using an 18mm lens, your shutter speed would be 27 seconds (500 / 18). As you can see, wider focal length lenses can use longer shutter speeds. Longer shutter speeds allow more light to be gathered by the sensor, thus you'll have more "super-human" capability! If you set your shutter speed to more than this formula indicates, you'll see the apparent movement in the stars in your image, rather than points of light. If you are shooting JPEG, you may need to set your white balance. There is no one correct white balance, as it depends on what kind of feeling you want to evoke with your image. I find setting the white balance for daylight works well, but you may prefer a warmier setting. If you shoot RAW (which is best), you can ignore the white balance setting, as it's set during post-processing, where you can decide after you've taken the shot how you want it to look. The two images to the right show how white balance affects night shots: the top one is cooler; the lower one is warmer. Lastly, set the ISO speed to something between 2,000 and 3,200 – you'll have to experiment with the ISO speed to get the right exposure. Just check your LCD after each shot – if too dark, you'll want to increase the ISO speed; if too light decrease the ISO speed. You want images that are a bit darker rather than too light. You'll find that you will want lower ISO speeds if you have a lot of light pollution. Lastly, make sure your camera is stabilized – a tripod is best, but even a bean-bag can work. As long as your exposure is at least 10 seconds, you won't need a cable release. Just press the shutter button gently, trying not to move the camera. A little bit of movement (e.g., 1/4 second movement) in the camera won't adversely impact an image where the exposure is 10 seconds. The "500 Rule" (dividing 500 by the lens focal length) to calculate the longest exposure is a very liberal formula. It will often result in slightly blurred stars (not sharp points). Thus, it might be prudent to reduce your shutter speed a bit. So, if the formula above indicates a 20 second exposure, you might only use a 15 second exposure. Alternatively, there's a formula called the "NPF rule". It's more complicated than the simple division of the "500 rule", but it will also provide a much better result. It's too complicated to get into here, but just Google "the NPF rule" for more info. To get really good results, you will want to post-process RAW images in Lightroom or Photoshop. The images below show how much of a difference there can be by editing a RAW image, compared to the JPEG that was produced by the camera. The image on the right is the edited RAW image. The settings are the same as above, except, you generally can use slightly lower ISO speeds and shorter exposures. Your exposure shouldn't be any longer than 10 seconds, as the aurora is constantly moving, and long exposures will result in a big blur of color, and you'll lose the "shape" of the aurora. 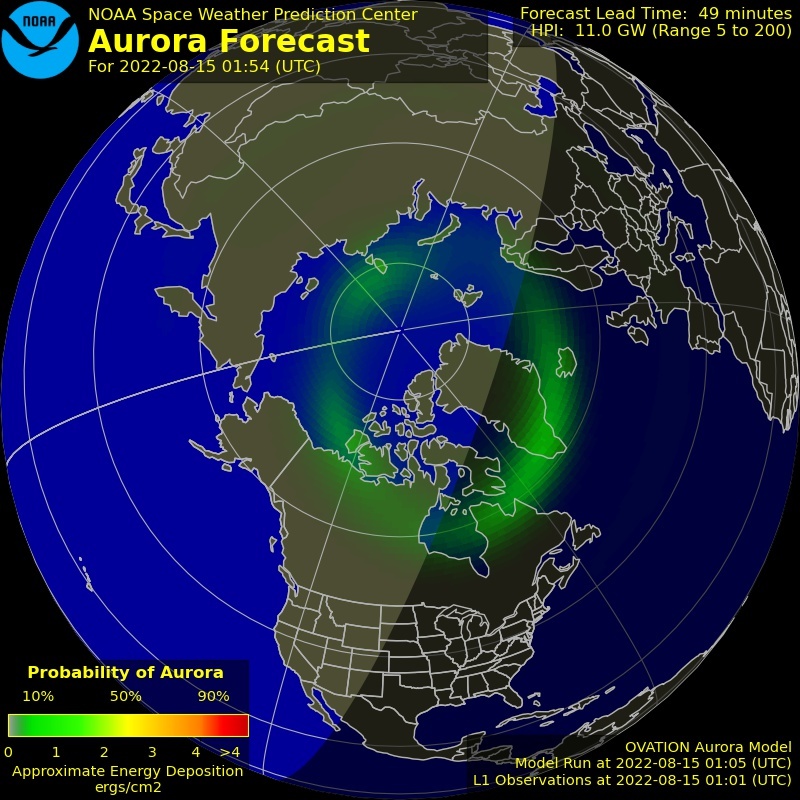 Use https://services.swpc.noaa.gov/images/aurora-forecast-northern-hemisphere.jpg for determining where an aurora will be active. Night photography can be immensely rewarding. But, you need to understand your camera settings and have the patience to work in the dark. Prior planning and setup is key – know where and when to shoot and set your camera up before it gets dark for the best results.